(Nanowerk News) Clusters of silver atoms captured in zeolites, a porous material with small channels and voids, have remarkable light emitting properties. For instance, they can be used for more efficient lighting applications as a substitute for LED and TL lamps. Until recently, scientists did not know exactly how and why these small particles emit light. An interdisciplinary team of physicists and chemists led by KU Leuven has now demonstrated for the first time where these properties originate (Science, "Origin of the bright photoluminescence of few-atom silver clusters confined in LTA zeolites"). Zeolites have a very rigid and well-known structure containing numerous small channels and voids. In chemistry, they are used to stimulate certain reactions. Molecules that are ‘caught’ in the voids of the zeolites lose their mobility and start behaving differently. 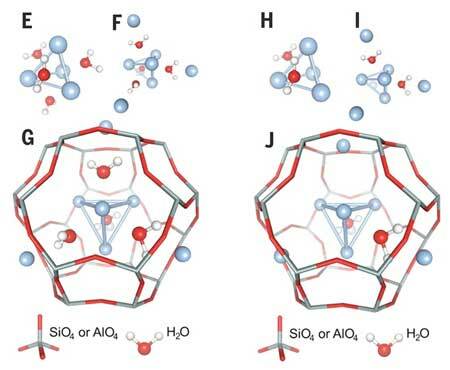 This research allowed the scientists to discover why and how silver clusters emit light when they are enclosed in the cages of a specific type of zeolite. “We irradiated a mixture of silver clusters with synchrotron radiation at the European Synchrotron Radiation Facility in Grenoble”, explains researcher Didier Grandjean. “What is good about this is that it provides us with a lot of information on the structure and properties of the material. However, as we specifically wanted to look at the optical properties, we used a new method that deliberately only measured the emitted light. This way, we were sure that we were only looking at the specific particles responsible for the light.” The research provided conclusive evidence that only small clusters of four silver atoms in the form of a tetrahedron and surrounded by water molecules emit light (see blue pyramidal shape in the figure). “The tetrahedra form a unit in which two electrons can move freely. This forms a so-called super atom: a structure composed of several atoms, but behaving very much like a single atom”, says Professor Peter Lievens. “The optical properties of the clusters are caused by the two free electrons. These decay from a higher to a lower energy level, resulting in a certain shade of green light. In turn, the energy levels are determined by the chemical properties of the super atom.” This new observation can be attributed to an intense collaboration between researchers in chemistry and physics. “Furthermore, our experimental observations are confirmed by advanced theoretical calculations”, says Peter Lievens. Advanced x-ray techniques using luminescence detection elucidate that four-atom silver clusters surrounded by water are responsible for the bright green color of silver containing zeolites. The luminescence originates from long-lived triplet states of two-electron quantum systems and confinement in the zeolite cages.